You would never think that beans make great desserts but they so do! I mean think of all the delicious recipes out there like Black Bean Brownies, Peanut Butter and Chickpea Cookies, and Chickpea Cookie Dough. If you have never tried any of them you must! The beans add a delicious creaminess that can be used to sub out a lot of the fat in recipes to make them much healthier and to add a giant dose of fibre as well, something most baked goods are missing. So get on the bean dessert bandwagon already. Preheat oven to 400 degrees F. In a medium bowl combine chickpeas, seeds and sunflower seed flour and set aside. In a small bowl combine coconut oil, maple syrup, cinnamon, cayenne and sea salt. Pour melted coconut oil mixture over chickpeas and seeds and mix well. Place chickpeas onto a baking sheet lined with parchment paper and bake for 30 minutes; then remove from oven and let cool. In the meantime, melt chocolate chips and coconut oil in a small pot over low-medium heat, stirring the entire time so the chocolate doesn’t burn. 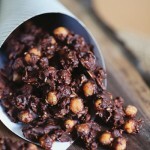 Pour chocolate over chickpeas, then place the cookie sheet in the fridge to cool. Once cooled, break off into bite sized chunks and try not to eat them all in one sitting. 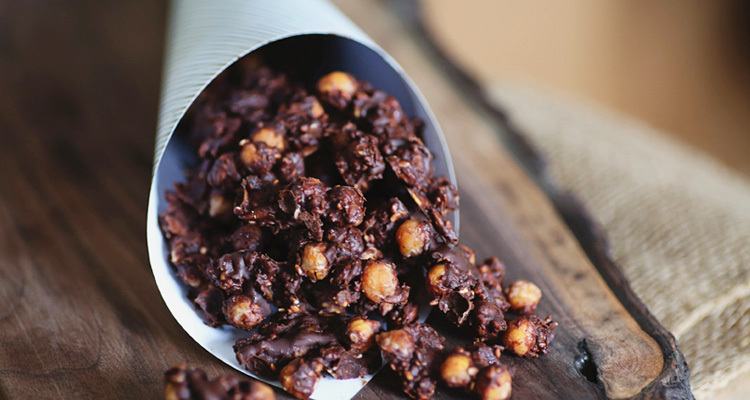 If you like this recipe and want to make more great snacks like this, check out my first cookbook Smart Snacking for Sports, which contains more than 40 nutritious and delicious snacks for active parents and kids. Thank you for sharing this recipe. I’ve made these many times and they’re absolutely delicious.